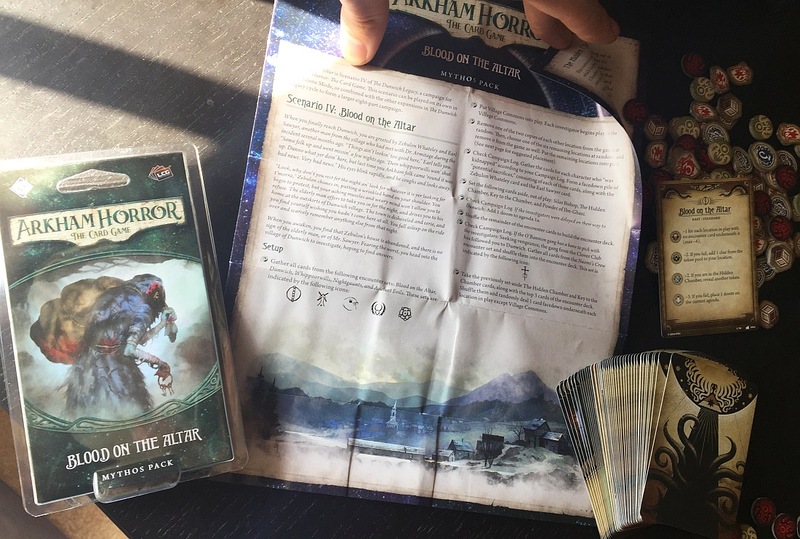 Quinns: So, we’re seven months on from when Matt and I first peeled the delicate outer membrane from the otherworldly Arkham Horror: The Card Game (otherwise known as ‘shrink-wrap’). We were stunned at how much fun we had. 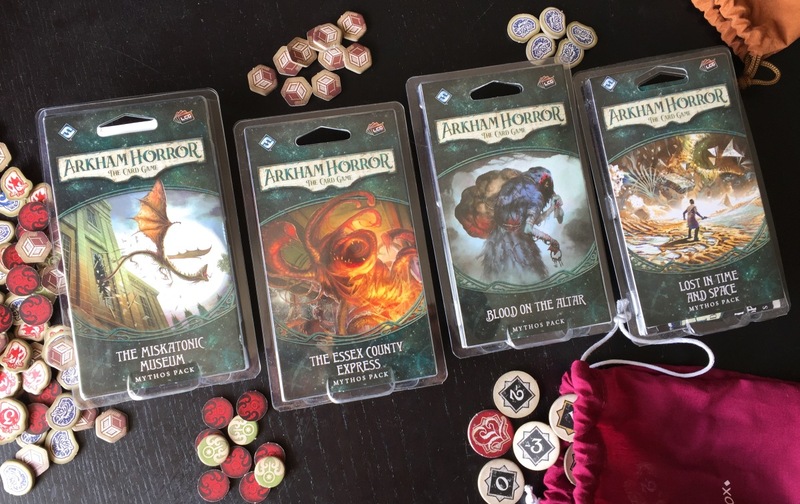 After years of rolling our eyes at Fantasy Flight’s Lovecraft products, we found that inside this small, unassuming box was an absolutely electric experience. I was as surprised as anyone when I announced that it was my favourite game of 2016. Now, you’ll remember that while you can go back and play this game’s scenarios on “Hard” and “Expert” modes, most of the appeal is in the first playthrough, making each new expansion pack feel like a long-awaited episode of a favourite TV show. You call your friends over, microwave some popcorn, put the popcorn in the bin so nobody can get grease on the cards and sit down to see what happens to your characters (and their decks!) next. Which begs a question. Now that the first full campaign has been published (seven expansions that make up The Dunwich Legacy), how’s this TV show doing? The Dunwich Legacy has fulfilled the promise found in the core box, delivering a grand campaign of surprises and not-entirely-spooky terrors. 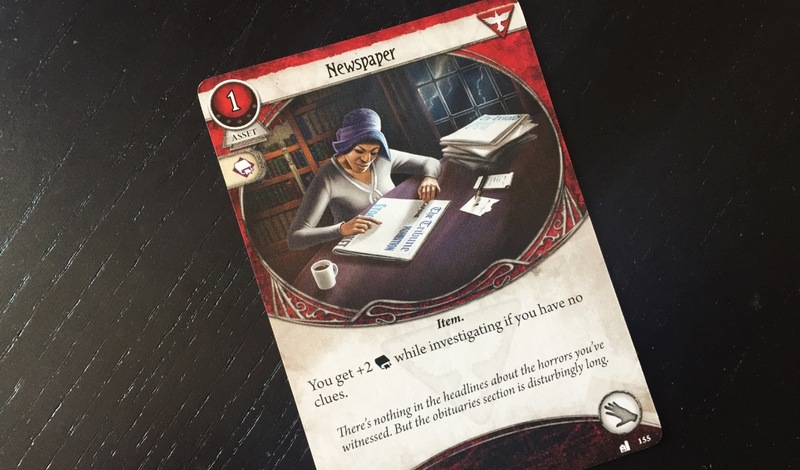 There are now enough Investigator cards to offer exciting choices when building your deck, and the length of the campaign lets you develop a real relationship with these decks that you’re tweaking. My friends and I are just two scenarios away from finishing Dunwich, and I’m as enthusiastic about seeing the finale as I am about trying a completely new deck type in the upcoming second campaign, The Path to Carcosa (seen below). If you’re still on the fence about picking this game up and committing to a campaign, I can now reveal that playing the full game is like… entertainment quicksand. Every time my friends and I meet up to play Arkham we find ourselves slipping that much deeper into the grip of an obsession. 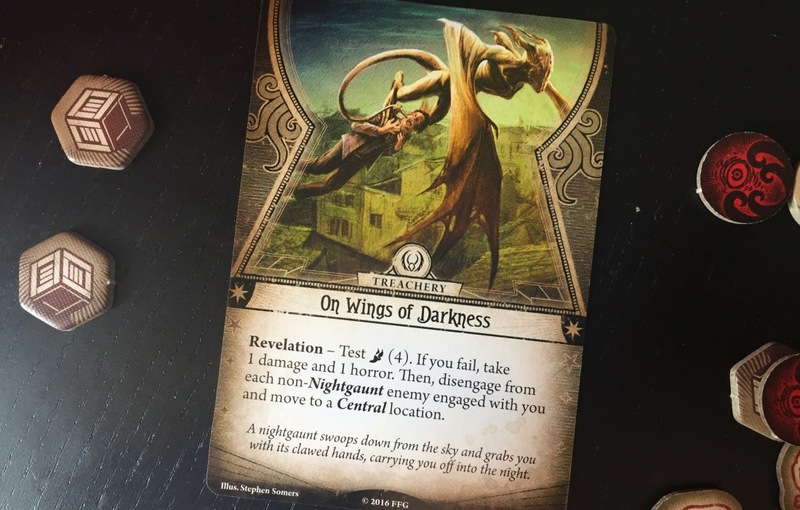 We break open packs containing new investigator cards that breathe life and danger and opportunities into the five investigator archetypes in the core box. 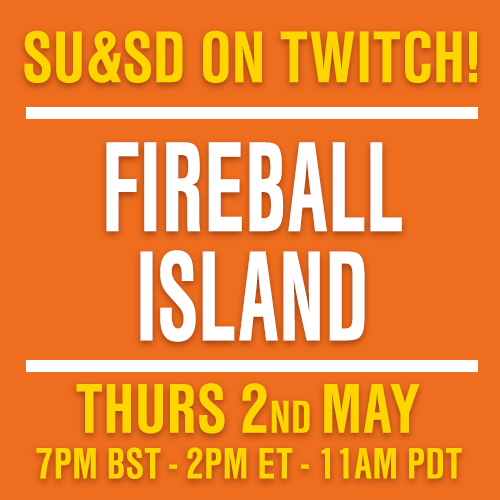 We wonder at what our own characters are going to be put through in this next trial, and share nostalgic memories of hijinks and failures from just a couple of scenarios ago. 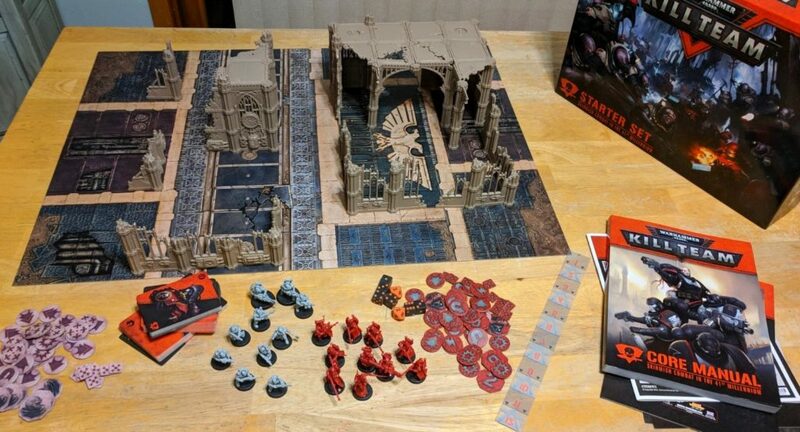 Think of it this way- you know how the most exciting part of a Legacy game is opening up a sealed box? 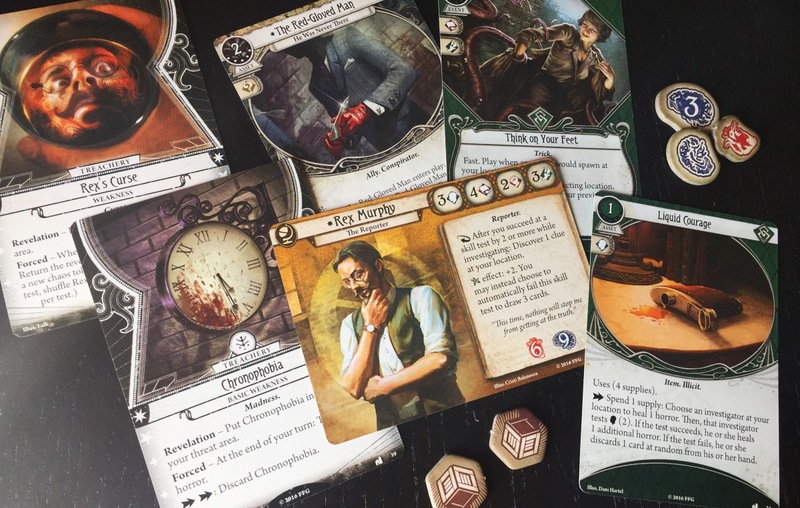 Arkham Horror: The Card Game sees you doing that every time you sit down to play it. It’s the height of decadence. It’s also expensive, which I’ll touch on later. But Dunwich hasn’t just been fun because of the new cards thwapping onto our table night after night. Spending more time with the game has revealed just how sturdy it is. The central mechanic of having to discard cards to improve the odds of passing a test (cards you put in your deck because you loved them! 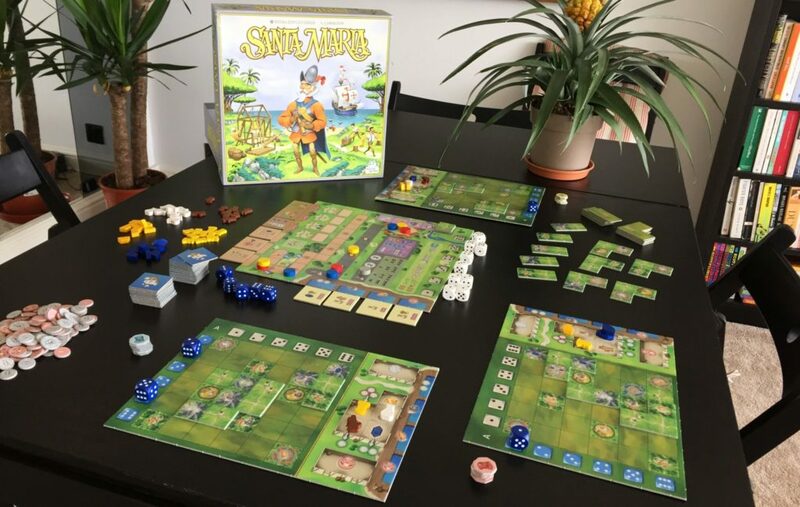 lost, like cardboard in rain…) but still not being able to make any test a sure thing sees players forever wrestling with greed and cowardice. Can you afford to hold this card back? Because if you do, and then you fail the test by 1, your whole table of players will shout in horror. What are the consequences of failing this test? How bad can things possibly get? And you never really know, which is part of the thrill. Depending on the shuffling of decks and the tokens you pull out of the bag, a scenario can be relatively easy if you approach it professionally, or it could keep you at arm’s length from your objective for the whole game, like a big brother with one hand on your forehead. You might go the whole scenario without pulling your weaknesses, or they might both come out at once. The scenario might come down to a single, desperate plan that comes down to just one pull from the bag. 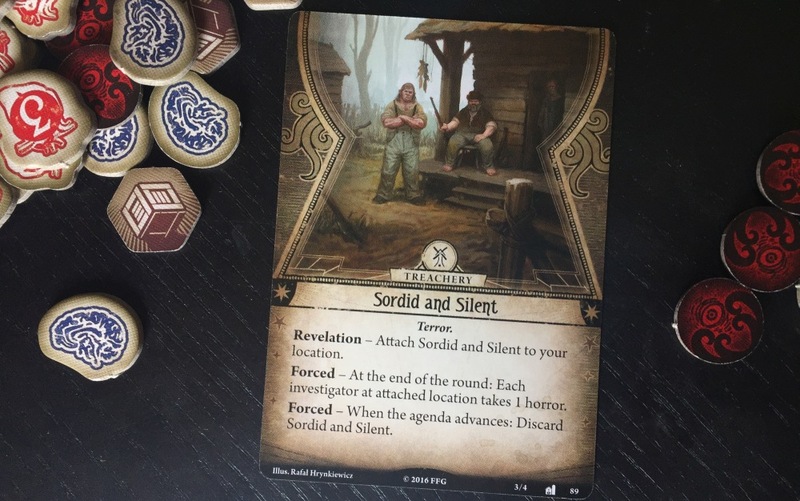 There’s a base-level thrum of excitement with every single draw of a card or token in Arkham Horror because there’s always a chance that this is the moment where things start going wrong for you, and the consequences for failure are occasionally laughably cruel. And perhaps that’s the real stroke of genius here- that players don’t know when and where punishment is going to be dished out (and ideally, in the year that passes before you play the campaign again on Hard, you’ll have forgotten). The game’s not actually that mean, so players never feel bullied, but you’re still nervous about what lurks around every corner. Kinda like you and your friends are walking through a haunted house? So, that’s a perfectly sturdy, thrilling game. Now, let’s talk about the story. So, here’s something that did catch me by surprise. The story of The Dunwich Legacy (told in a couple of hundred words before and after each scenario) is one of the most astonishingly shonky bits of fiction I’ve seen outside of the back of a cereal box. It’s a plot comparable to taking a valium in front of a budget horror film and waking up whenever there’s a gunshot. But so long as you’re not expecting grand storytelling, I will say that this failure is completely fine. In fact, it’s better than fine, because it suits the game perfectly. And here we’ve arrived at something that I do want to correct from our original video review, where we mentioned that Arkham Horror: The Card Game was occasionally quite funny. We were wrong. The truth is that it’s very funny, almost all of the time. But since these cards are a mix of the mundane and the supernatural, and player decks and scenario decks are shuffled into total randomness, even the most evocative and spooky scenario is instantly rendered down into a tearfully funny Cthulu madlib. You might be wandering through a cult’s icky headquarters, draw a card from your deck looking for a weapon and suddenly remember your mother’s crippling hospital debts and lose all of your money. In our last game the peak of the tension was a journalist chasing a bird around with a baseball bat. Matt was telling me about one scene in his campaign where one of their investigators, a jazz musician, was at one point alternately playing his trumpet, vomiting, and then playing his trumpet again. If your character has absolutely no idea what the hell is happening, a newspaper can help to give them a lead. A perfectly sensible card. Nothing silly about that at all. …Until you’re playing a scenario where the clue tokens you collect represent you escaping a burning building, or something similarly overblown. What happens then, when someone plays a newspaper from their hand? Does a newspaper get thrown through the window with the headline “BUILDING CATCHES FIRE: WHY DIDN’T THEY LEAVE THROUGH THE FRONT DOOR”? I’m sure some people won’t see the funny side of this game, but if you have an eye for the surreal then it’s just gut-busting. You might play a policeman who enters a suspect’s house, burgles it, spends the money on a lightning gun and promptly murders the man who lives there. Meanwhile, his colleague outside is having such bad nightmares that his dog gets tired(?). It’s a beautiful combination of art, storytelling and mechanics. There are no immediate, terrible consequences of this card, you just have to put it on a location and the locals there start watching you, giving you the heebie-jeebies. And reading this card made me feeling like I was right there in Dunwich, creeped out by the sordid and silent locals. And while I was considering the horror of being unwelcome, my buddy was carried off by a pterodactyl. 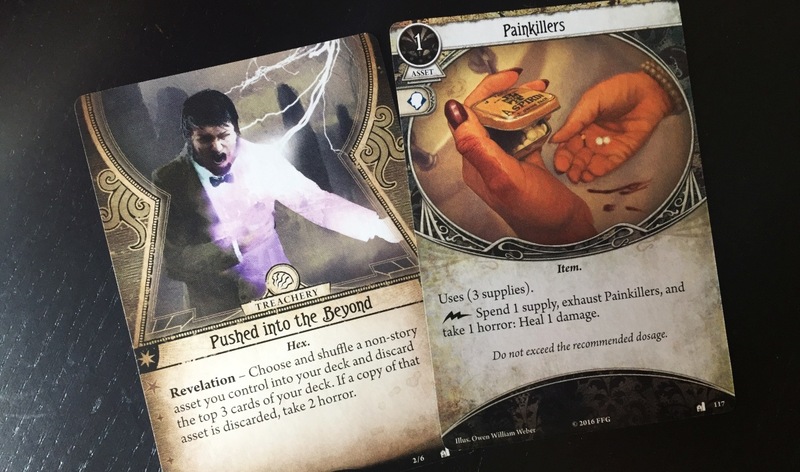 Was this moment the Arkham Horror Card Game working as intended? Possibly not. Was it entertaining? Oh god yes. The final point I want to revisit is one of cost. 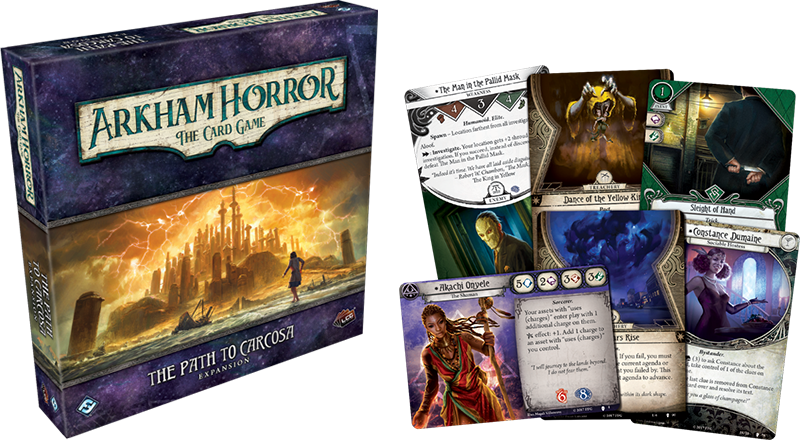 The core set of Arkham offers three scenarios for £30 as well as a teetering stack of investigator cards. The Dunwich Legacy expansion box offers two excellent scenarios for £23, as well as lots of investigator cards. But the mythos packs that complete Dunwich are £15 for one scenario and don’t have many investigator cards at all, which means value for money takes a bit of a nosedive. Obviously you have to make your own mind up as to whether that’s too expensive for you, but what I will say is that while Arkham is expensive for a board game, it’s not expensive for a truly great time. This isn’t just the game that I’ve played the most this year, it’s the one I’ve enjoyed the most. And if you really want to squeeze every hour of enjoyment from that first runthrough, here’s a tip: An Arkham scenario is about one hour per player, and it’s also significantly harder with more players. 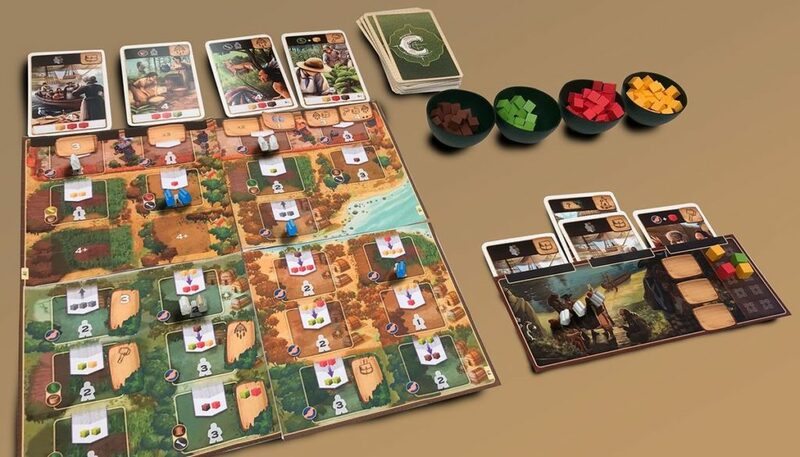 That means that while two players can have a pacy trip through two scenarios in a long evening, a three player scenario is liable to fill an evening by itself. You’ll play more turns, and you’ll have more turns that require careful consideration. Playing with more people also gives you more people to split the cost of the expansions with. I personally wouldn’t want to go up to four players, I think that would be a little slow for my tastes, but if you want a truly big, epic story? Four players would do it. But however many people you’re thinking of playing with- just play. Shut Up & Sit Down Recommends the Arkham Card Game more than ever before. It’s equal parts silly and atmospheric, tense and playful, smart and dumb. It’s unthinkable. It’s unknowable. And… oh god. At this rate, it might just become my favourite game of 2017, too.